Apollo 17 landing site imaged by Lunar Reconnaissance Orbiter. A few months back, while debating the moon landing hoax with a relative, I was asked “Why don’t they just prove it by pointing a telescope at the moon and showing us the landing site?”. I tried to explain how even the most powerful telescopes ever built could not resolve something the size of a car from 350,000 km away, and especially not while looking through our turbulent atmosphere, but they were having none of it. I suspect that they were just winding me up. But a little over two years ago, the Lunar Reconnaissance Orbiter (LRO) was launched and placed in a low orbit around the Moon to image and map the entire surface of the Moon with unprecedented detail. Later that year, the first images came back of the Apollo landing sites. For the first time since 1972, we had taken direct photographic proof of human activity on the lunar surface. The images showed equipment that had been left behind, as well as the tracks left by the lunar rover, and the astronauts shuffling back and forth between their various objectives. But from 50 km up, even the sensitive cameras on the LRO couldn’t reveal any detail. Now, LRO’s orbit has been changed from a circle 50km above the moon, to an ellipse dipping as low as 21km, allowing for much more detailed imagery. And the results are just astounding. 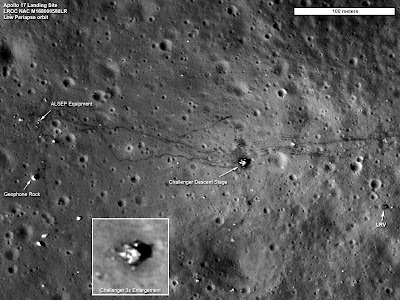 Tracks are well defined, equipment is clearly visible, and small craters can be seen which match those shown in photograph and film records taken by the astronauts.